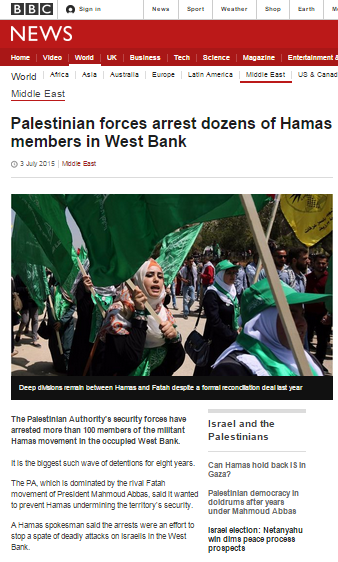 In addition to the ‘Newshour’ report previously discussed here, BBC coverage of the Palestinian Authority’s recent arrest of Hamas operatives also included a written report appearing on the BBC News website’s Middle East page on July 3rd under the headline “Palestinian forces arrest dozens of Hamas members in West Bank“. 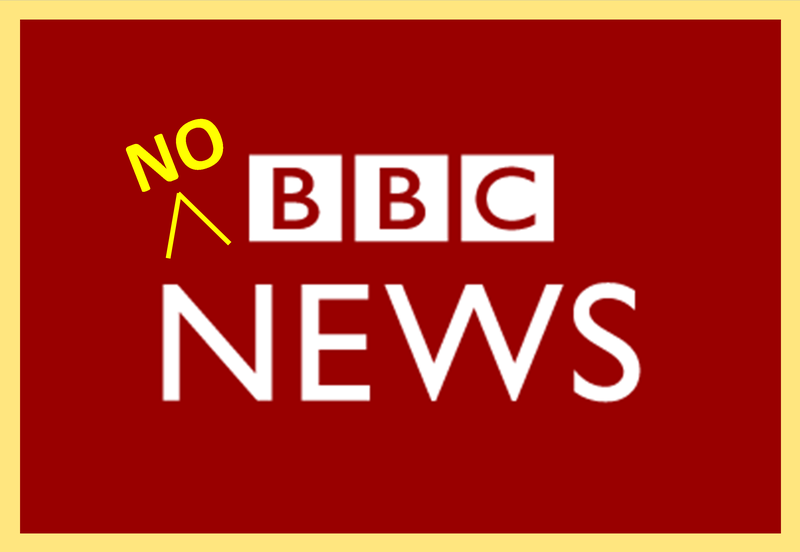 Bearing in mind that the BBC has refrained from informing its audiences about Hamas’ attempts to strengthen its presence in PA controlled areas and that English language coverage of the recent uptick in terror attacks against Israelis has been virtually non-existent, readers must have found the following paragraphs very confusing. “A spokesman of the Palestinian Authority, Adnan al-Dameri, said those arrested would be put on trial on the charge of threatening security and stability. “A Hamas spokesman said the arrests were an effort to stop a spate of deadly attacks on Israelis in the West Bank. Husam Badran accused Palestinian security forces of working for Israel and said Hamas held Mr Abbas personally responsible. “Highly sensitive” to whom is not clarified but it is notable that only a few weeks earlier the BBC told its audiences that the Palestinians were to end security cooperation with Israel. As anyone who followed the progress of the short-lived Palestinian Unity Government will be aware, the divisions between Hamas and Fatah are far from “renewed” and “reconciliation” never got off the ground. Next comes a highly sanitized description of Hamas’ violent coup in the Gaza Strip with no mention made of the fact that the legitimate elected mandates of Hamas, the PLC and the PA president long since expired. The last eight paragraphs of the article are a hodge-podge of unrelated news. “Also on Friday, an Israeli general accused Hamas of providing support to an affiliate of the jihadist group Islamic State in Egypt’s Sinai peninsula. In an interview with Al Jazeera, Maj-Gen Yoav Mordechai, named members of Hamas’s military wing who he alleged were involved in training militants from the affiliate, known as Sinai Province, and smuggling those wounded in clashes with Egyptian security forces into Gaza for medical treatment. Those wishing to view Major General Mordechai’s interview with Al Jazeera Arabic (interesting not least for the ‘journalistic’ approach taken by the interviewer) can do so here. Details of that incident can be found here. Despite chronic under-reporting of the subject of Hamas’ attempts to undermine the PA by strengthening its presence in PA controlled areas and the lack of adequate coverage of the recent rise in terror attacks, like their colleagues at the BBC World Service the website’s journalists made no attempt to provide audiences with information needed to properly understand this story and its wider implications. Very rarely does the BBC cover internal Palestinian affairs and hence such superficial reporting is all the more unfortunate.